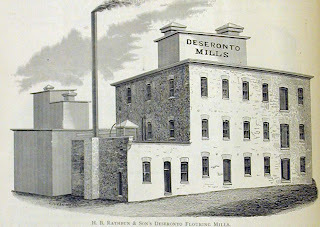 A mention in the Napanee Standard of April 7, 1881, led former Deseronto archivist, Ken Brown, on a detective trail to hunt down a published description of ‘Deseronto and its industries’. The article in question appeared in the journal Lumber World, published in Buffalo, New York, in 1881. This publication proved difficult to find, but eventually we established that the Hagley Library in Wilmington, Delaware, held a copy (call number: TS800.L98). This library specialises in collecting the records of American enterprise (and is based on the site of the original DuPont gunpowder factory). The library’s head of imprints, Max Moeller, was incredibly helpful and has furnished the Archives with a digital version of the article.